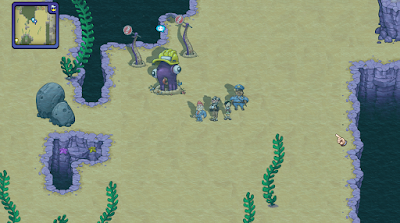 - Seabottom’s a side area that you will initially access while trying to recruit the Lifeguard. You can find her on Crystal Beach, southwest of the blocked bridge that leads to Capital City. Speaking to her about recruitment will throw you right into the area, and she’ll ask you to speak to a squid about not killing people anymore. This triggers the Lifeguard Recruitment quest. Clairvoyant Clams. Similar to Cone Crabs, Clairvoyant Clams can hide in their shells to avoid damage. Kill ‘em quick before they can retreat. Not a big threat otherwise. Maniac Mine. You’d think this thing might blow up, but it simply attacks one person or multiple each turn. Standard stuff. Scuba Fish. They hit fairly hard, but can’t take much abuse. Try to wipe them out with physical attacks before they puff up and increase their defences. - Your primary objective down here is Safety Squid, the cause of so much underwater misery. You’ll find him to the northeast of the entrance, sitting out in the open. Wander up and give him a beating. This is not a difficult fight, and if you’ve already battled Safety Squid’s Tentacles you’ll know what to expect. Safety Squid consists of the body and two Tentacles, and all three do basically the same thing: they either hit you or they inflict stop on you. Annoying, yes, but not that incredibly painful - especially since the Tentacles stand a good chance of curing stop. They can conceivably all stop you in one round, though, so do your damndest to get rid of the two Tentacles in the first round or two, curing your ailments when possible. Electrical attacks from Conspiracy Guy work great. Once the Tentacles are gone, Safety Squid itself is a pushover. Besting Safety Squid will allow you to recruit the Lifeguard once you get back on land. The Lifeguard will allow you to move off of beaches and into the water whenever she’s in your active party. As such, she always needs to be present when you go underwater, whether into Seabottom or another underwater area. $500 if you walk off the edge of the map in the southeast corner. There’s a Cola sitting out in the open on the way to the $500, as well. That’s all for this area. The last item of note down here is in the far, far south, where you’ll find an exit to Panjama Island. The sharing of your wonderful is that I wish at this time because of the problems you are fit to share what I was looking for. -- Play run 3 game.